One-Pot Chicken and Mushroom Fettuccine Alfredo – A delicious and easy weeknight or weekend meal! Everything is simmered in just one pot, fewer dishes! Hey there! It’s Chelsea from Gal on a Mission, here again, bringing one heck of a delicious dinner option! Easy-peasy, right? 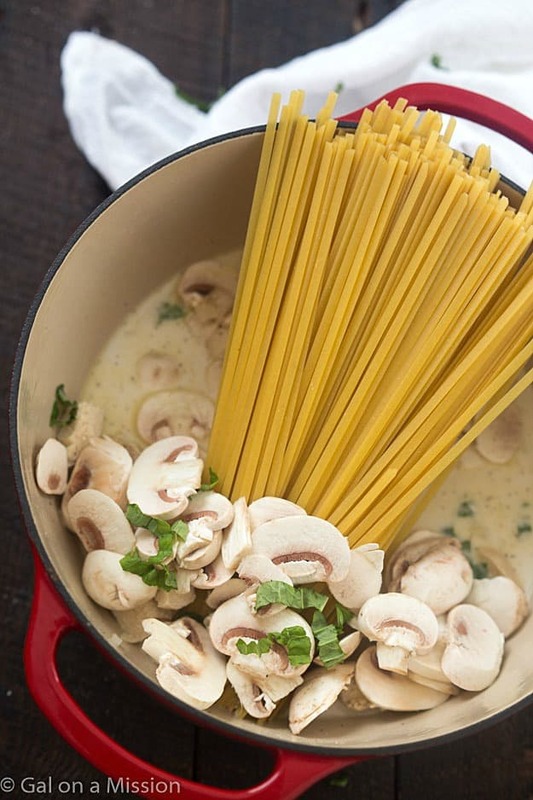 If you have never tried one-pot meals, like this one-pot chicken and mushroom fettuccine alfredo, you are going to be hooked. It’s the best invention ever. Normally we do not have many leftovers from pasta, but if you do, I have a trick for you. The pasta usually dries out in the refrigerator, for me at least, I usually add 1-3 tablespoons of milk to thin the sauce out while reheating it. 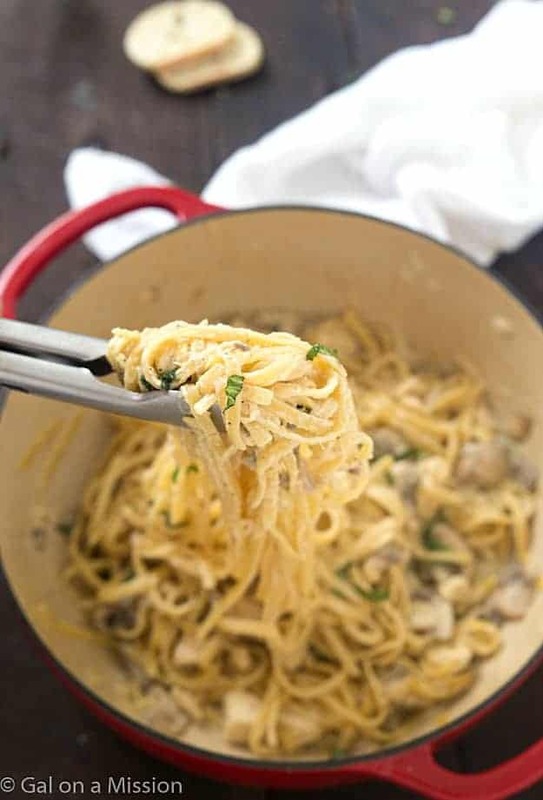 Place the onions, chicken, butter, basil, heavy cream, chicken stock, salt, pepper, garlic, mushrooms, and fettuccini noodles in a 6-quart dutch oven. Simmer over medium heat for 15-20 minutes or until the pasta is al dente. One pot meals are the best!!!!!!!!! I made this last week and our entire family really liked it! I had to cook it a bit longer to soften the noodles and I also added a bit more cream towards the end, because there was not a lot of liquid for the noodles to cook in. I used a rotisserie chicken which made it easier too. It made enough for 2 adults and 4 children, with a bit leftover. We will definitely make it again! Does anyone know the serving size? Is it a cup each? Made this last night for my family and it is hands down our favorite Alfredo recipe! It has so much flavor! I used minced garlic instead of powdered and half and half instead of heavy cream. Also my chicken was baked with rotisserie seasoning earlier in the day. My suggestion for this might be to prboil noodles a. It well al dente to help the cooking time and not cooking down of sauce so much. Could you use something besides heavy cream? Half and half. I actually used 2% milk and it turned out great! We have tried many of your recipes and they have all been excellent! My wife and I are both avid cooks and always know we can trust your recipes ! Your recipes look delicious. I am on a low fat low carb diet, do you have any recipes that are lower in fat and carbs? Can this be made with a red sauce instead of white. My family doesn’t care for the alfredo. You can sure try it with red sauce. I have not tried this method but I am sure that it would work just fine. Please let me know what you think and how it turns out! I would love to know! Yes, it may not be as rich and creamy though. That is so great to hear! Thank you for sharing! 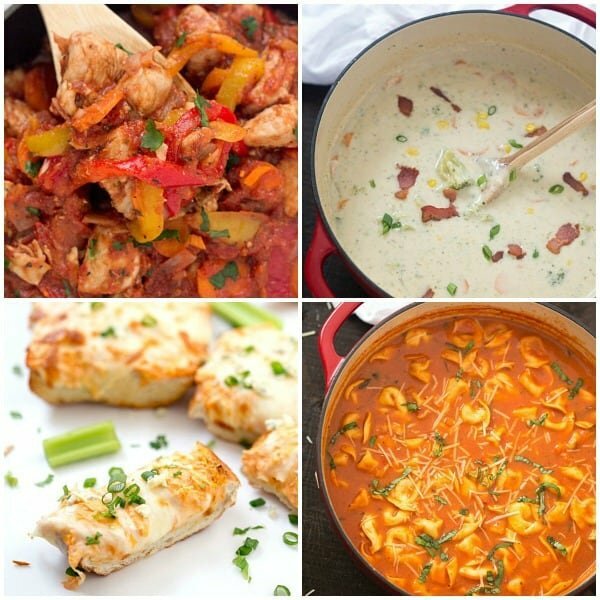 I am so glad that your family has loved this one pot recipe! Thank you for following along with me!